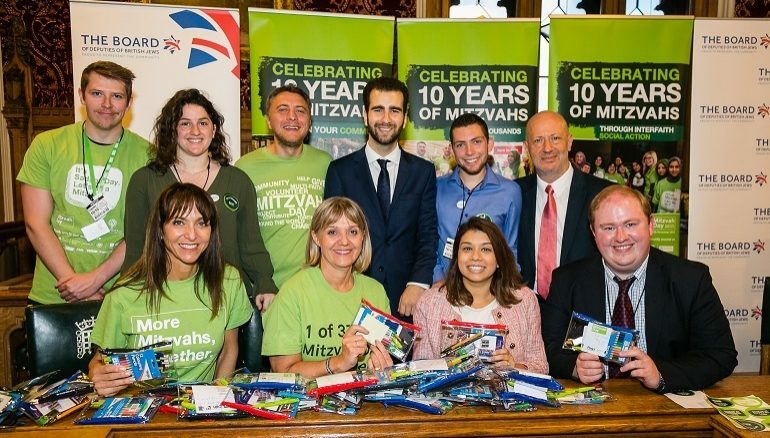 Twenty-nine MPs and Peers from across the political spectrum came together to celebrate the 10th anniversary of Mitzvah Day by taking part in a social action event inside the Houses of Parliament. Take a look at our photos from the day by clicking here. Parliamentarians – who included Labour Shadow Foreign Secretary Emily Thornberry, Liberal Democrat Leader Vince Cable, Conservative Party Vice Chairs for Communities Helen Grant and Rehman Chishti and SNP Westminster Group Leader Ian Blackford – packed pencil cases for School Aid, a charity that provides educational equipment for children in Africa. The stationary sets packed by the MPs and Peers are being sent to schools in the Commonwealth country of Lesotho. Other MPs taking part included Tulip Siddiq, Bob Blackman, John Cryer, Theresa Villiers, Alex Sobel and Fabian Hamilton – who all represent constituencies with large faith communities. The launch event marked the start of the month leading up to Mitzvah Day (Sunday November 18), the UK’s biggest faith-based day of social action. The event was organised with the Board of Deputies of British Jews and the All Party Parliamentary Group (APPG) on British Jews. Over the last 10 years, Mitzvah Day has seen Jews, Muslims, Christians and people of all faiths, and none, come together in social action. The charity, which was established in 2008, asks people to give their time not their money to help those in need. Starting in the UK, it has now expanded internationally with more than 30 countries taking part in 2018. Mitzvah Day has long enjoyed support from across the political divide. Many MPs and councillors will once more take part in activists in their constituencies on, and around, Sunday November 18. The other Parliamentarians attending the event were Alistair Carmichael MP, Baroness Altman, Chi Onwurah MP, Dame Rosie Winterton MP, Ian Austin MP, Ivan Lewis MP, Jim Fitzpatrick MP, Joan Ryan MP, John Spellar MP, Jonathan Djanogly MP, Karen Lee MP, Liz McInnes MP, Lord Stone, Lord Mendelsohn, Lord Palmer, Sir David Amess MP, Sir Peter Bottomley MP and Tan Singh Dhesi MP. On Mitzvah Day 2018, more than 40,000 volunteers across the globe are expected to take part in projects to help the homeless, elderly, refugees and some of the poorest and most vulnerable in society. Mitzvah Day was represented at the event by its Founder and Chair Laura Marks OBE and Interfaith Chair Lady Daniela Pears. Laura said: “Mitzvah Day not only sees all of Britain’s different faith groups come together in social action, but it also brings together civil society and Government. The Board of Deputies of British Jews is the national representative body of the UK’s Jewish community and it provides the secretariat to the APPG on British Jews. As well as combatting antisemitism and promoting religious freedom, it brings the Jewish community together to pursue social action projects. Laura Marks OBE, Lady Daniela Pears and Edwin Shuker were joined at the Parliamentary launch by Board of Deputies Parliamentary Officer Joel Salmon, School Aid’s UK and Africa Operations Manager Thomas Broom and Daniel Kosky and Grace Diamond from the Union of Jewish Students.